GP and nurse appointments can be booked on-line, by phone or in person at the surgery. To register for online services, contact reception. You will be asked for a brief reason for your appointment this is to enable GPs to prepare for your appointment and to ensure you are booked with the correct nurse in the appropriate room. To loc in to our on line services click here. All GP appointments are 10 minutes long. To help our GPs run to time, if you have multiple problems you need to discuss you will need to book a double appointment. Most nurse routine appointments are 15 minutes long though chronic disease appointments are generally 20 minutes. We need 24 hours notice if you are unable to come to your appointment. If we have your mobile number we will send you a text to remind you that you have an appointment the following day. For tips on how to make the most of your appointments click here. Appointments can be booked up to 8 weeks ahead with the GP and with the nurse. GP appointments are available on Mondays from 07:30. Late Monday evening GP and nurse appointments are also available for patients who cannot come during normal working hours. Patients who believe they have an urgent medical problem or one that needs to be dealt with before the next routine appointment will be triaged by the Duty Doctor. This means the receptionist will ask you for some basic medical information and the GP will assess your request. If you think you might need to be seen on the day, please phone as early in the day as possible. Telephone triage is proven to be a safe and effective way of offering high quality care and reducing the need to see every patient ringing for an appointment. On average 50% of triage appointment requests do not require a face to face GP appointment which saves both GP and patient time. The duty doctor will prioritise the clinical need for an appointment and offer an appropriate appointment. Due to the ‘urgency’ of the request, the patient will have limited options on when this will be. If there is a clinical need, patients are guaranteed an appointment before the next routine and will be booked into one of the special appointment slots held for triaged patients. We cannot offer your usual doctor in urgent cases or be flexible appointment times. You can speak to your doctor or nurse on the phone. Reception staff will inform you when they will phone you. Urgent and same day matters will be dealt with by the duty doctor. The Practice is committed to providing a safe comfortable environment where patients and staff can be confident that best practice is being followed at all times and the safety of everyone is of paramount importance. For more information on our chaperone policy click here. From June 2015 all patients registered with the practice will have been given a named accountable GP. This is a contractual requirement but patients are entitled to choose to see any GP or nurse in the practice. GPs start visiting after the end of morning surgery. We are unable to guarantee which GP will visit but you may specify a male or female GP. If you're off work sick for seven days or less, your employer should not ask for medical evidence that you've been ill. The seven days includes days that you don't normally work. When you work out how long you have been off sick, you should include weekends and bank holidays. If you're off work sick for more than seven days, your employer will usually ask you to provide proof that you've been ill. They will normally ask for a fit note from your GP. Note: We can back date sick notes but we can not future date them. Ideally you should call us on the day you want the sick note to start. Many employers have their own self-certification forms. 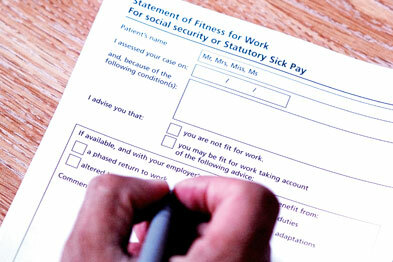 If your employer doesn't have its own form, it may use an SC2 form from HM Revenue & Customs instead: Employee's Statement of Sickness (PDF, 53kb). you are "not fit for work"
you "may be fit for work taking into account the following advice"
For more information, including what "may be fit for work" means, see What are fit notes? If you need a fit note, contact us and we will advise you if you need to make an appointment. We can often provided sicknotes without seeing patients if for example you have ben in hospital. There is never a charge from an NHS doctor for providing a fit note if you're off sick from work for more than seven days. Some employers may request a fit note from employees who repeatedly take time off sick, for example, even if each time they're off work it's for seven days or fewer. For sickness of seven days or fewer, we may charge to provide a fit note but we will advise you beforehand what the charge will be.